A speed control algorithm for an ACC (Adaptive Cruise Control) system for curved roads is proposed based on driver behavior characteristics. 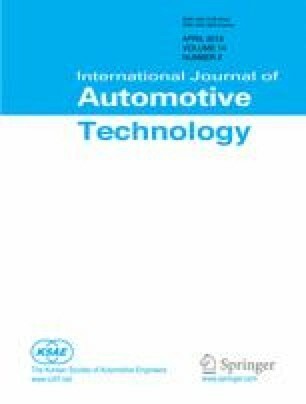 As the foundation of this research, a driver speed model for curved roads is developed using a series of experimental data regarding driver behavior. To adapt the model to each driver’s individual curve speed behavior, the coefficients of the model are identified in real time from the data sequences collected during drivers’ manual operation stage by a self-learning algorithm based on a Recursive Least-Square (RLS) method with a forgetting factor. Using this algorithm, the parameters of the driver model can be identified from the data collected in the manual operation phase, and the identification results are applied during the ACC automatic control phase. Based on the developed model, the ACC speed control algorithm is modified to provide each individual driver with a customized speed profile for the scenario of a curved road with no car ahead. Tests verify the applicability of the modified system.